Basic concepts in traverso tuning. What interests us is the relation between the temperaments that were much used in the eighteenth century and the temperament peculiarities shared by most traverso's. I am not aware of any systematic research comparing the temperaments of a number of traverso's. This should be done because each traverso has its own peculiarities as well as temperament properties that are shared by all traverso's. The traverso is a conical tube with a cross-section that is larger at the mouth hole than at the end. The length of the tube of course is the first choice. This has a strong influence on the d/1. The tube is not just conical with a straight line tracing the cone. The cone is irregular. These irregularities are important both for the tone quality and for the tuning. It is remarkable that, while the bore size is between 12 and 20 millimeter approximately, changes of .2 millimeter can have an important influence on the instrument. Rules for making these local irregularities are not really known. I use certain models of nodes and anti nodes to decide how to correct problems found in the original. Narrowing the bore is easy and the effect of widening is the opposite of the effect of narrowing. Position, size and form of the finger holes and the mouth hole all influence both the tuning and the tone quality. Increasing the size of a finger hole makes the tone that ‘goes with it’ higher and decreasing the size makes it lower. A restrictive factor for making finger holes is our fingers. The holes can not be to far apart and must easily be covered by our finger tops. The two aspects size and position are not independent. A higher smaller finger hole can have some effects with respect to tuning the same as a lower larger hole (see e.g., ). However the effect on the tone quality will of course be different. Also the effects in the different octaves are different as well as the effect on the forked fingerings. The finger holes are usually undercut. This means that the size of the hole is larger internally than externally. This undercutting again is crucial for both tuning and tone quality. The effect of undercutting top, bottom or sides of the tone hole is different. Some basic rules can be found in . It should be stressed that changing an instrument should be done preferably by the original maker but in any case by an instrument maker. Changes made by a player who is inexperienced in tuning instruments should be strongly advised against because it may easily ruin the instrument! Everything in a traverso influences everything more or less!! In the following an example for the relation between tuning the traverso and temperament is presented. The f♯/1 is a tone that is obtained opening holes five, six and seven only. By closing six and seven this lowers to f/1. However it does not lower enough for equal temperament. The important hole for tuning both notes is hole six. Increasing for instance hole six will make both notes higher. There are possibilities in the bore to influence the tuning of both notes somewhat independently, but never such that they come to an equal temperament. So all traverso flutes have a have the difference between f/1and f♯/1 smaller than an equal temperament half tone. Is this bad? Yes and no. We are so used to equal temperament that most of us are inclined to find that right.However the pure major third is just 13.7 cents smaller than the equal temperament third. This means that the pure major third on d gives a lower f♯/1 than equal temperament does. This is exactly what we find on the traverso. So for music in d this is not so bad at all. Many of the temperaments used in the eighteenth century have the same property. It is clear from this that the need for correction of the tuning depends on the key. Much of the eighteenth century music obviously takes this into account. The music and the flute grow together to playing in all keys toward the end of the eighteenth century. The flute for this reason gets more and more keys (see ‘The flute between renaissance and Boehm’). This does not imply that the one-keyed flute suddenly disappeared. This flute has been produced until the twentieth century. It is clear that where the one keyed flute beautifully agrees with the music of the first half of the eighteenth century the end of this century sees a need for the flute with keys and a different tone quality. I intend to collect temperament information about originals, to investigate what may be termed inherent characteristics for traverso's (maybe in periods). A difficulty with this is of course that different people will find very different information simply because of their ways of blowing. Below the discrepancy with equal temperament for eight different original one keyed flutes (first octave) is displayed. Different people play the instruments. As mentioned I realise that the findings much depend on the players. However the tendency certainly are typical. Eight flutes statistically is a small number. So I have no pretence to scientific rigidity in what follows. I intend to increase the number of flutes involved. If lines coincide one colour is chosen. This makes the individual series difficult to distinguish but that is not the intention of the picture. One thing is immediately obvious: if a modern maker of replicas tried to sell a flute with deviations like all but one (the Kuijken Rottenburgh) of those flutes it would not be appreciated. The deviations from equal temperament are too large. As mentioned before equal temperament has basically nothing to do with the issue. It is just looked at as a reference. As a theoretical reference however it is pretty good because it is neutral in the sense that it distributes the corrections evenly. We shall look at other references in the following however and that will give us other yard sticks. Certain remarks could be made here on what we see in the graph. For instance the blue line, with a about -10, b about -20 and b♭ 0. As soon as the a and b are tuned higher by opening the respective holes or undercutting or changing the bore, the b-flat will also be high as on the other flutes. However I think that this graph should be looked at so to speak "through the eyelashes" to get an impression. It is furthermore very important to be aware of the fact that the player of a traverso can and will compensate the tuning to suite the particular key, the atmosphere and the temperament of other instruments. Therefore in a way these considerations are academic. An aspect that also has not been taken into consideration here is the change of taste with respect to temperament during the eighteenth century. 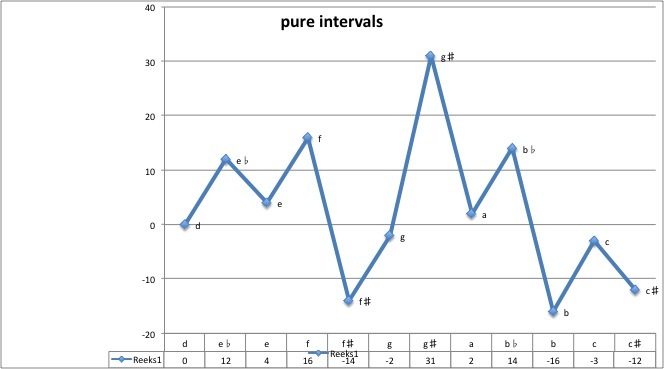 The following graph gives the difference between pure and equal temperament intervals on d in cents. Let us compare this with the flutes shown in the earlier graph. This is not usual because pure intervals on one note were not a temperament to be used in practice. However it is interesting to compare with the originals. 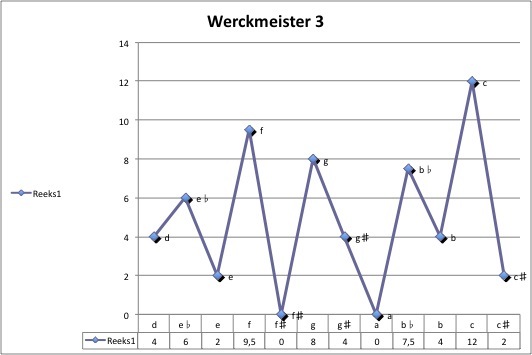 First impression is that the Werkcmeister temperament is much closer to equal temperament than the temperament of the traverso's shown above. At first site one would say that there is more relationship between the traverso temperament and pure intervals than between the traverso temperament and Werckmeister.